Coventry & Warwickshire law firm Alsters Kelley LLP has confirmed it will be sponsoring Woman Who… again in 2018. The firm who sponsored the ‘Woman Who….Achieves for a Charity or Social Enterprise’ Category at the Woman Who…Awards in May this year, have signed up for another year with Woman Who… as one of the main sponsors. The Woman Who…Awards recognise the achievements of women in business and have been specifically created to highlight and celebrate some of the regions’ most outstanding and inspiring business mentors and role models – women who make a difference in the workplace and in the wider community. Woman Who is delivered in partnership with the FSB Warwickshire & Coventry and Leicestershire, Northamptonshire & Rutland Regions. 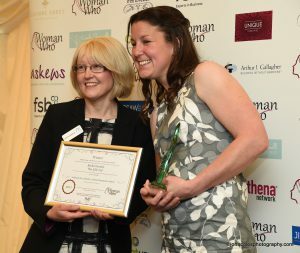 The aim of the Awards is to encourage women to recognise their abilities, shout about their successes to motivate others, gain confidence through the Awards process and to develop through the experience. Alsters Kelley join Athena Network Warwickshire, Opt HR and the Coventry Telegraph who have already confirmed their sponsorship for 2018. Interested in sponsoring Woman Who…?